theatre of noise: "But isn't Kennedy already dead?" Jonathan Weiss has made a feature-length film of J.G. 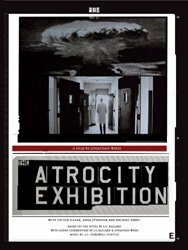 Ballard's 1970 "condensed novel" The Atrocity Exhibition, hardly the most filmable book ever written. And now it is available on DVD in PAL format, or at least it might be as of January 2006. It's all a bit difficult to comprehend, and the web site, which demands 3.6MB of data to render a single page, certainly sets some sort of new record for lack of usability. In any case, the DVD is 25 euros and contains a full-length commentary from Ballard himself, who is hip to the film-maker's interpretation. Eventually I'll get a copy and let you know what I think. As a massive Ballard fan for a quarter of a century you know I'll be in full critical mode! And sometime I'll tell you the story of how my friend Chris and I got the film of Crash made. 1 I say "my" because I've effectively forgotten which parts were written by Christopher Keep and which by myself. It's a nice feeling. Your best source for information on Ballard is this eponymous site, which lately has contained a link back to this very article (hmmm...circularity), and has a permalink to the Electronic Labyrinth article mentioned above. it features a review of the atrocity film (http://www.ballardian.com/weiss-atrocity-exhibition-review), plus a photo gallery (http://www.ballardian.com/weiss.html), and will soon be publishing an interview with the film's director, jonathan weiss.